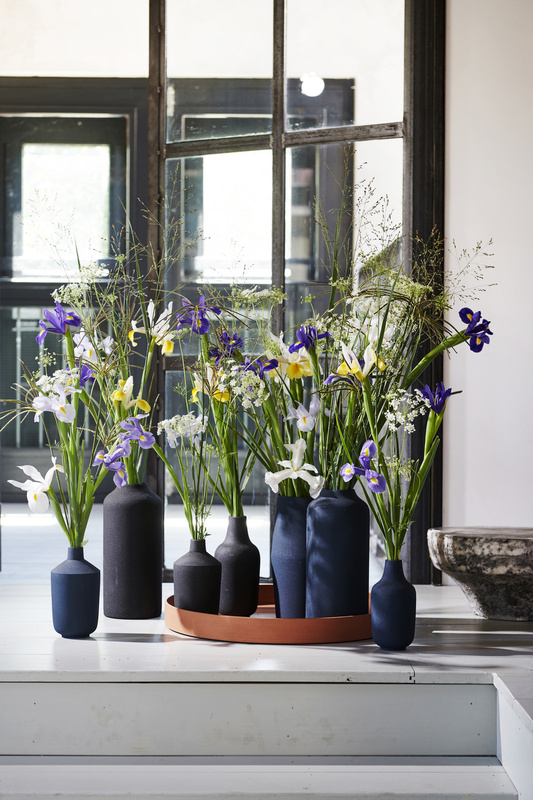 Elegant flowers with three hanging and three upright petals make the iris one of the most eye-catching spring flowers. There’s something regal about them, because the fleur-de-lis symbol is derived from the iris. At the same time they have a natural look, as if they could be growing amongst the reeds. 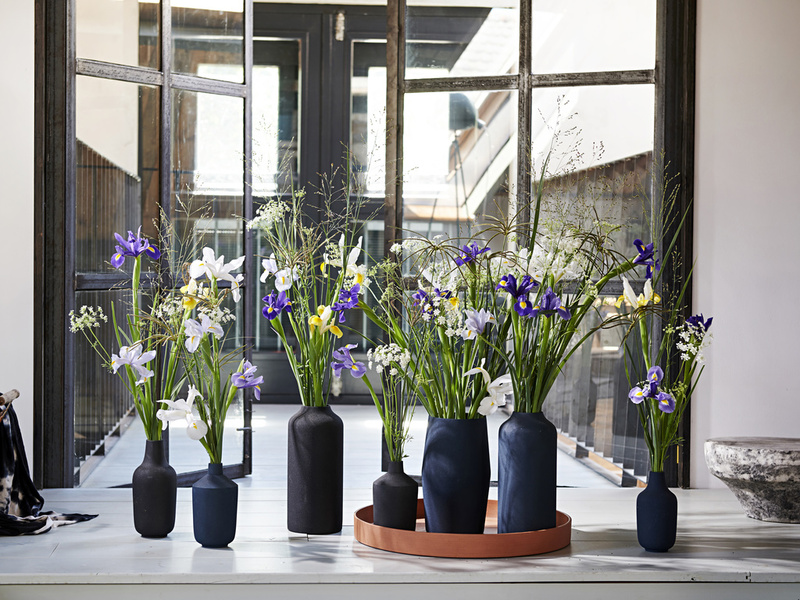 Perfect for the style trend that is all about pure products with strong lines, the iris is traditionally a cut flower that can cope with mono bouquets and arrangements. Growers are now pre-treating the flowers, which has greatly enhanced the lifespan. This means that the flowers always open and they have an excellent vase life. The iris is a member of the Iridaceae family and there are around 300 species in the wild, particularly in the northern temperate climate zones. The flowers grow from bulbs that have a talent for survival, and can cope in dry, cold and damp areas. The flower probably arose in Central Asia. The popular cultivated irises originate from bulbs that developed in Spain, Portugal and North Africa. 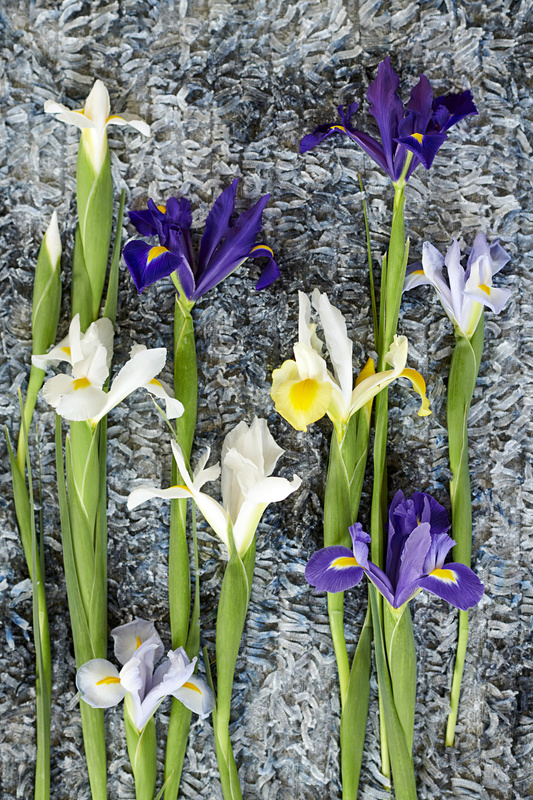 The most common flower is the ‘Dutch Iris Group’, with a slender and elegant stem and flower, available in many shades of blue, from sky blue to steel blue and lilac. There are also yellow, white and even bi-coloured irises. The German Iris from the ‘Germanica Group’ is offered in a wide range of colours, has coarser flowers and has threads on the lower blade that resemble a beard. They are therefore known as bearded irises. Check length, weight and ripeness of flowers, check for empty buds. Iris must be free of pests and diseases. Watch out for botrytis (grey mould). Drooping, dry or shrivelled flower stems indicates that the flowers are old and have been stored for too long. Trim 3-5 cm off the stems with sharp secateurs or a sharp knife. 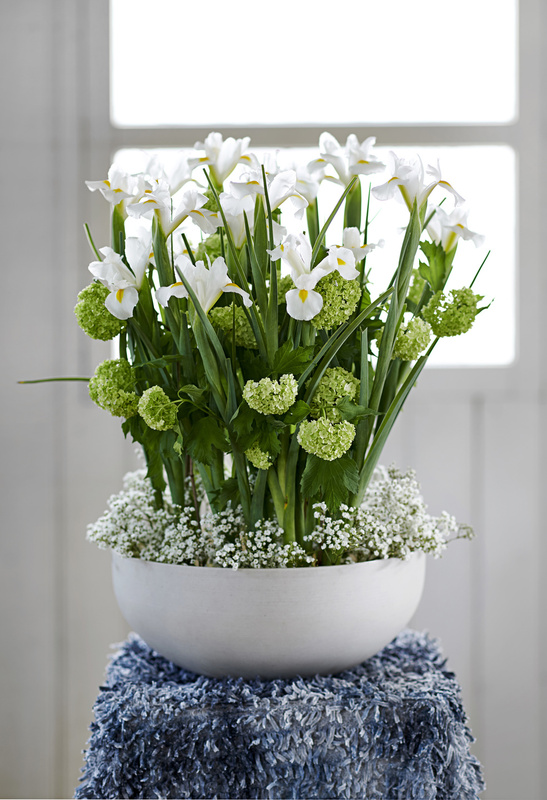 Place irises in clean buckets or vases with clean water. Add a preservative specially designed for bulb flowers. This food ensures that the flowers open properly and have a good vase life. The flowers should not be allowed to be damp as a result of excessive humidity or condensation. This will encourage botrytis, which rapidly diminishes the decorative value. Irises can be stored in the cold store at 2°C, preferably upright in order to prevent them growing crooked. 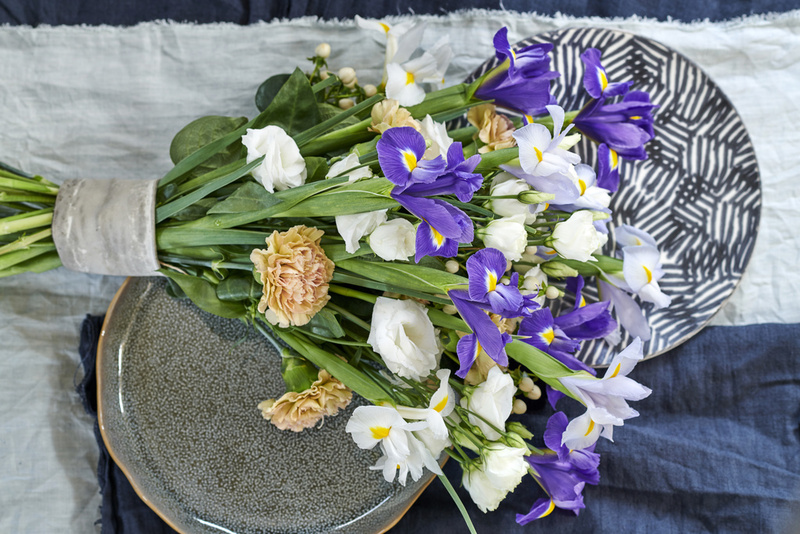 The shorter the storage time, the better the flower will last in the vase. 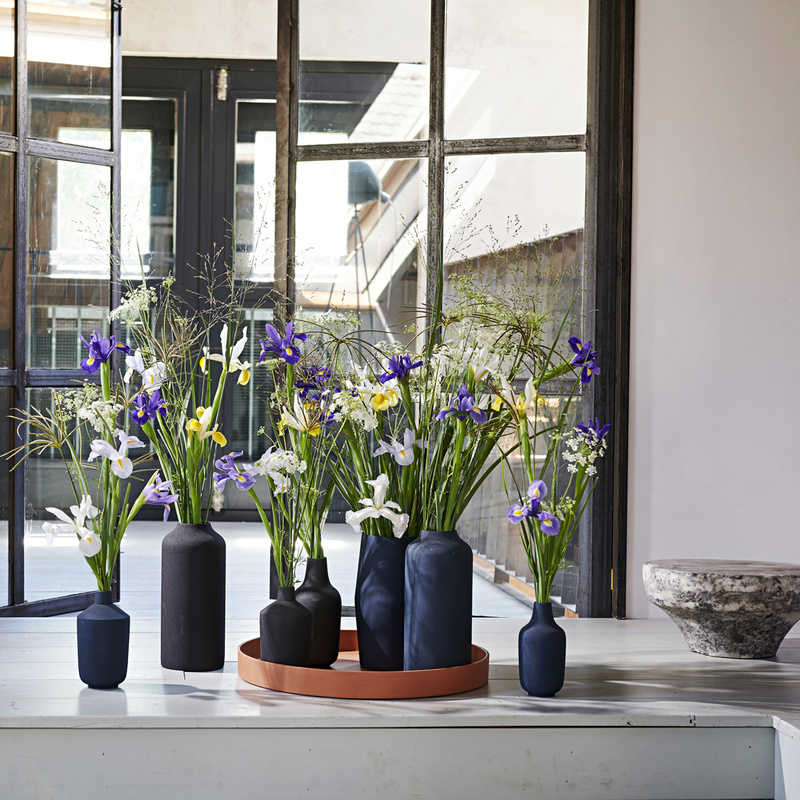 The most eye-catching thing about the iris are the shades of blue, which are rare amongst cut flowers and which combine beautifully with white and yellow, giving cheerful spring combinations with Forsythia and blossom branches, for example. Display them like that together on the shelf as an appealing celebration of spring. Irises are well-suited to a surprising parallel arrangement, and the strong stem makes them suitable for tall arrangements in florist foam. Cut around 3-5 cm off the stem with a sharp knife. 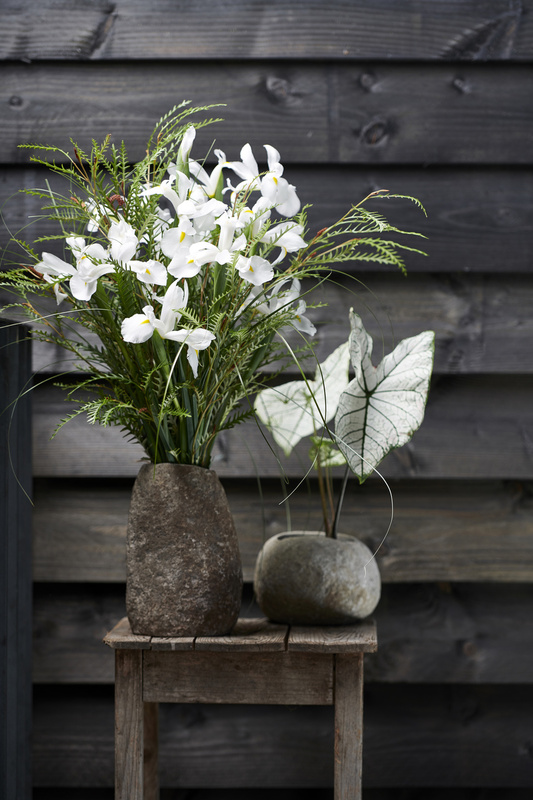 Fill a well-scrubbed vase with clean water and cut flower food or special food for bulb flowers in the right concentration. This helps the flowers to stay beautiful for longer in the vase. Do not place irises in a draught, in full sun or near central heating. Do not place the flowers near a fruit bowl either: fruit produces ethylene gases which cause the flowers to age rapidly. Inspiring images of every flower on the Flower Agenda have been produced in line with the Horticulture Sector Trends 2019 (Groenbranche Trends 2019). These trends are a translation of the latest consumer trends and are specifically aimed at the horticulture sector for use both indoors and outdoors. If you would like to find out more about the 2019 Flower Agenda, click here. The rose will be in the Flower Agenda in February 2019. You can download and use these inspirational images free of charge if you credit Funnyhowflowersdothat.co.uk.